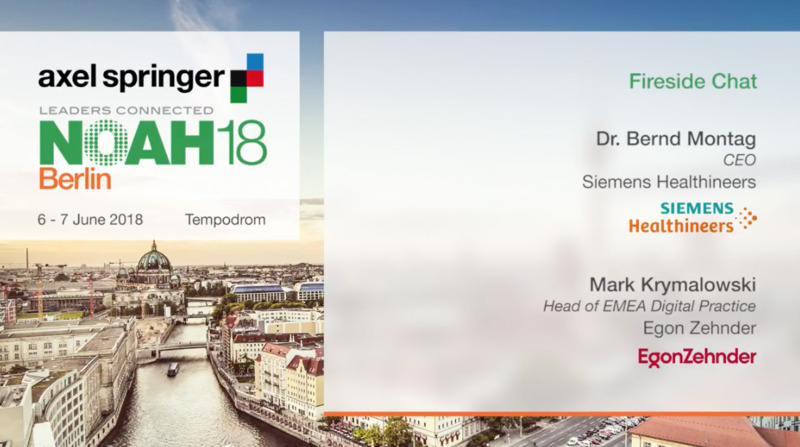 On 6 June at the Tempodrom in Berlin, Mark Krymalowski, Head of the EMEA Digital Practice at Egon Zehnder, sat down with Bernd Montag, CEO of Siemens Healthineers. The conversation was part of the Axel Springer NOAH Conference 2018, which focuses on connecting leaders to empower the European Digital Ecosystem. Bernd Montag spoke about leading one of the largest IPOs in Germany, emerging imaging technology and the opportunity of data to drive research forward. To develop innovative solutions, you need the right people on board. At Healthineers, the team invests heavily in R&D and developing pioneering talent who are dedicated to and passionate about healthcare. Watch the full conversation. Learn more about NOAH18 Berlin.